When Arik Ehle, Wild Westside, isn't busy creating stuff during his busy day job, he is expanding his OG Impala MINIs line with new editions. 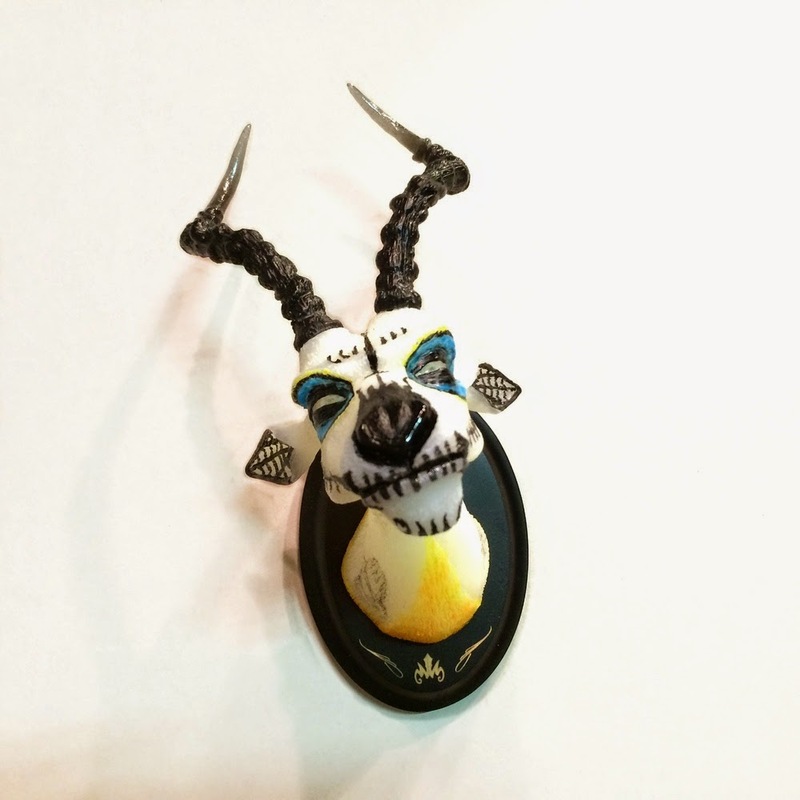 Available for pre-order now is Wild Westside's 'Dia de Los Muertos' edition of the OG Impala MINI wall mount. This piece is limited to just 10 pieces and priced at $70 plus applicable tax and shipping. Made with resin, wood and acrylic paints, the bust itself is made of a black light reactive, milky, semi-transparent resin. Each piece is hand painted with glow in the dark paint and affixed to a custom engraved wood plaque. Be sure to order one of these quick, since these are limited to just 10 pieces. Who knows, more colors may be on the way in the future. 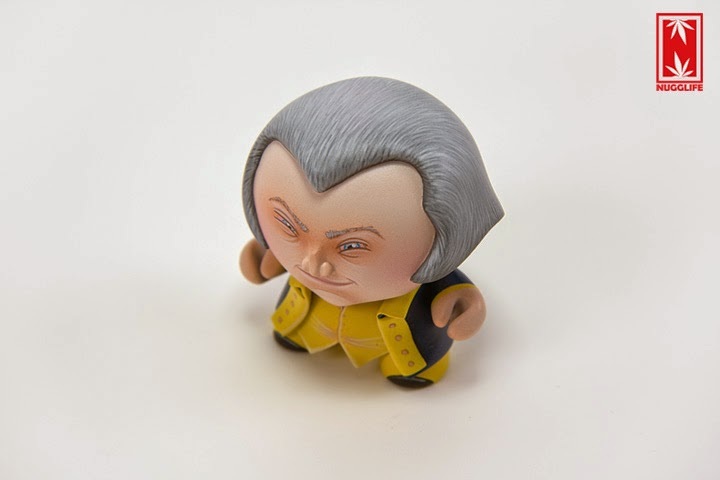 Nugglife's latest 3" Custom Dunny creation is "George Nuggington". 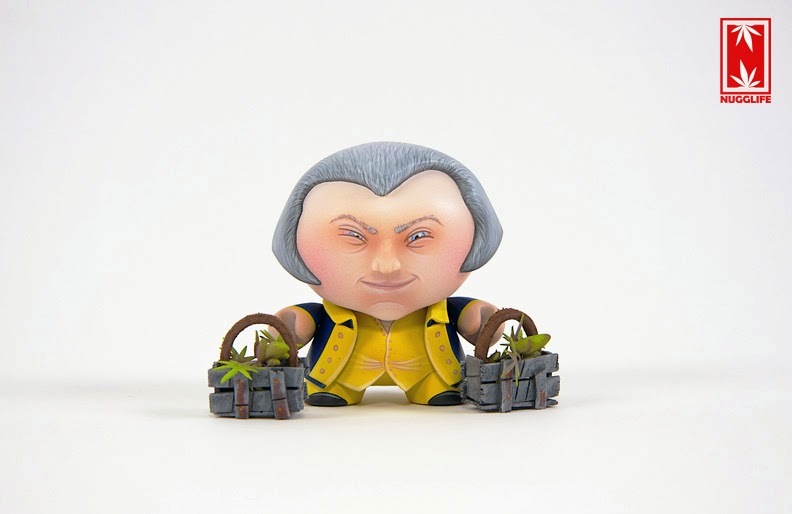 As described by Nugglife, George Nuggington is the first founding father to recognize the importance of hemp to building USA. 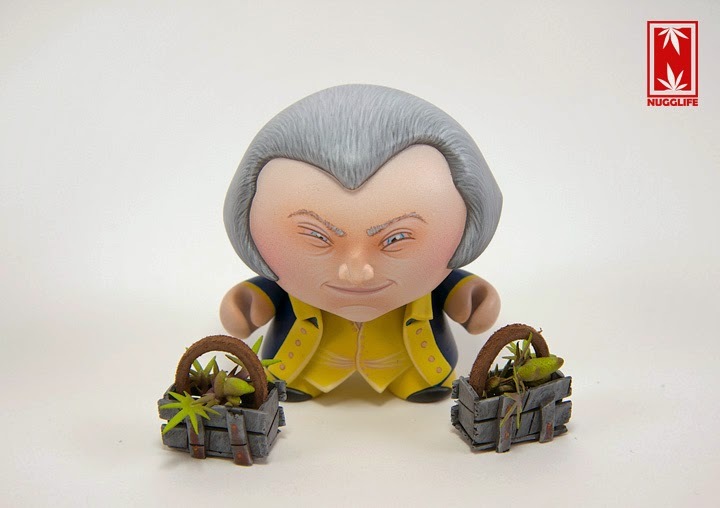 A 3" Dunny has been sculpted and painted with inspiration from a founding father, to create this amazing custom. To top it off, a pair of hemp planters were created to complete the theme. For those interested in this piece, this was a commission. Be sure to get in touch with Nugglife, Ian Ziobrowski, for any commission requests. It’s Friday and we are Dead as F#ck!! 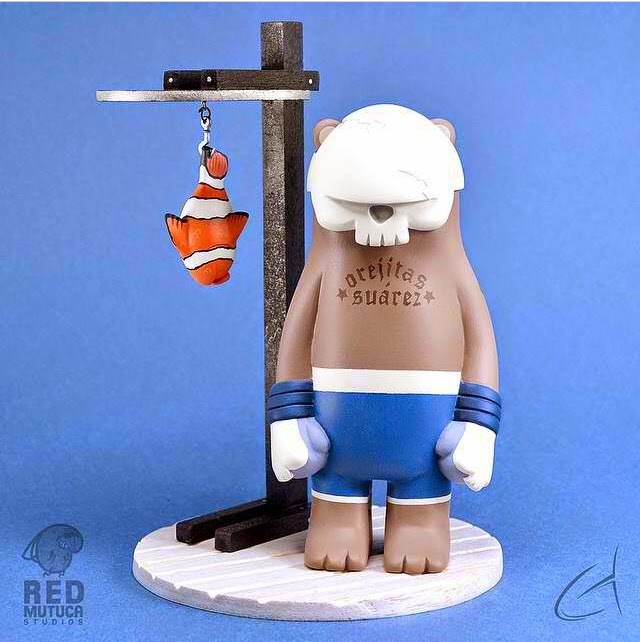 Custom Dead As F#ck resin figure by Venezuelan toy art superstar Charles Rodriguez (Red Mutuca Studios)! See this beautiful custom piece and many others at NYCC Booth 208 in the Suburban Vinyl space. 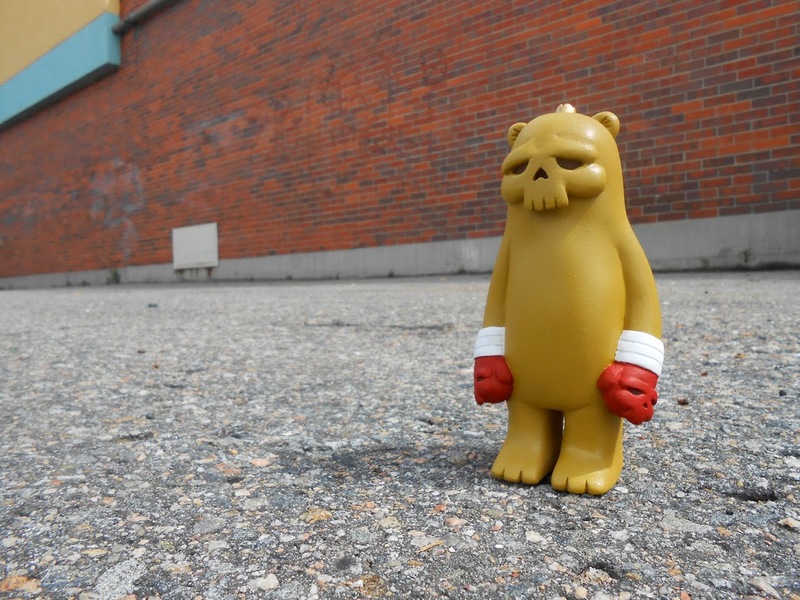 The Dead As F#ck figure was designed by JC Rivera and cast in resin by We Are Not Toys. Follow along with IG hashtag #deadasfck to see all the artist pieces. The launch of Maker Faire in the Bay Area in 2006 demonstrated the popularity of making and interest among legions of aspiring makers to participate in hands-on activities and learn new skills at the event. 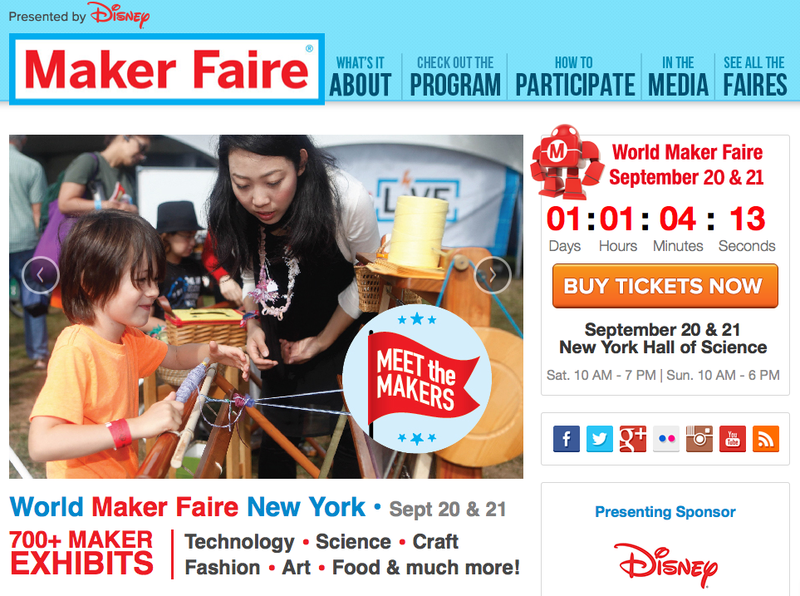 A record 195,000 people attended the two flagship Maker Faires in the Bay Area and New York in 2013, with 44% of attendees first timers at the Bay Area event, and 61% in New York. A family event, 50% attend the event with children. Also in 2013, 98 independently-produced Mini and Featured Maker Faires occurred around the world, including Tokyo, Rome, Santiago, and Oslo. Outsmart Originals is proud to present two new incredible releases from artist Nathan Hamill. 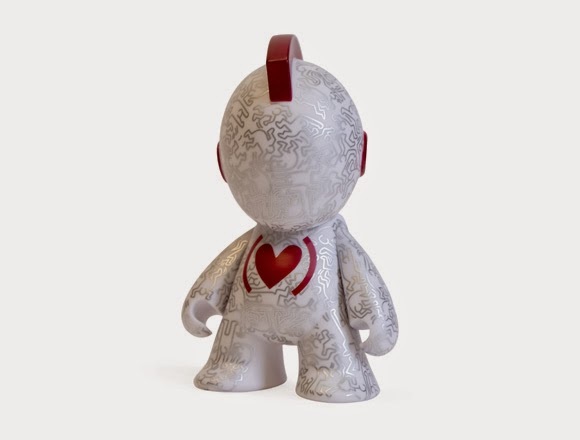 Based on his iconic designer vinyl figure, Lavabear, we are thrilled to be working with Nathan on these new releases. We have two t-shirt projects dropping in October with the first being ‘Lavabear Rising’ featuring the vibrant and sharp, eye-popping color design screen-printed on ultra cotton tees. The second release, ‘Lavabear: Artist Edition’ depicts the character in an original hand-drawn design by the artist. A mix between minimalism and abstract styles, the artist has created a classic version of Lavabear that is easily identifiable as well as fascinating. **Both releases are now available for pre-order and will only be printed to order and are scheduled to ship in October. Men’s shirts will be screen-printed using ultra cotton tees for a classic and long lasting fit while the women’s tees will be printed on soft-style ring-spun cotton jersey tees for a flattering fit. 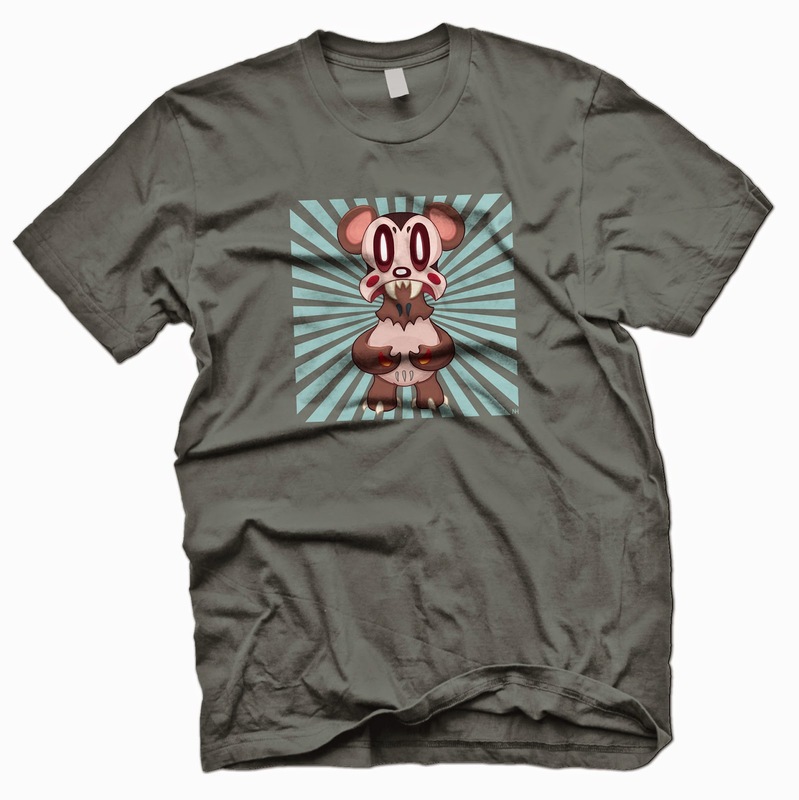 Join the Lavabear clan and proudly show your support for Nathan Hamill’s loveable creation. "Lavabear was once a shapeless, colorless being created from stardust by The Those. Over time, he rose into a vibrant, ursine-esque creature. His sole purpose was to guard the entrance to the Sacred Realms of Märchen and, along with it, its memories, treasures, and secrets. The legend goes that if awoken from his deep hibernation, those foolhardy enough to trespass on his Sacred Grounds will be met with a terrible and ancient wrath. …returning him once again to his deep, sound slumber." CHECK OUT ALL THE OUTSMART ORIGINALS SHIRTS HERE! Some seriously f#cking cool designs from amazingly talented artists. This ad published 18/09/2014 in the Vancouver (BC) paper was brought to my attention by fine artist Camilla- long time friend to the Designer Toy industry, exemplifying the care we as a community have for each other. Designer Toys is a small, tightly-knit community. 21/09/2014 With the availability of more accurate information, some clarification is needed. 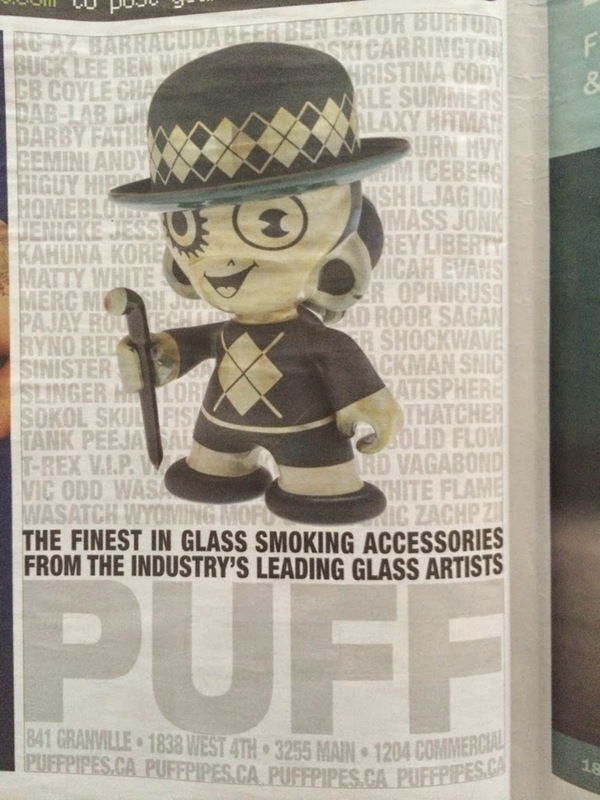 Puffpipes (.ca) are toting an advertisement depicting an un-credited glass sculpture, and pipe. 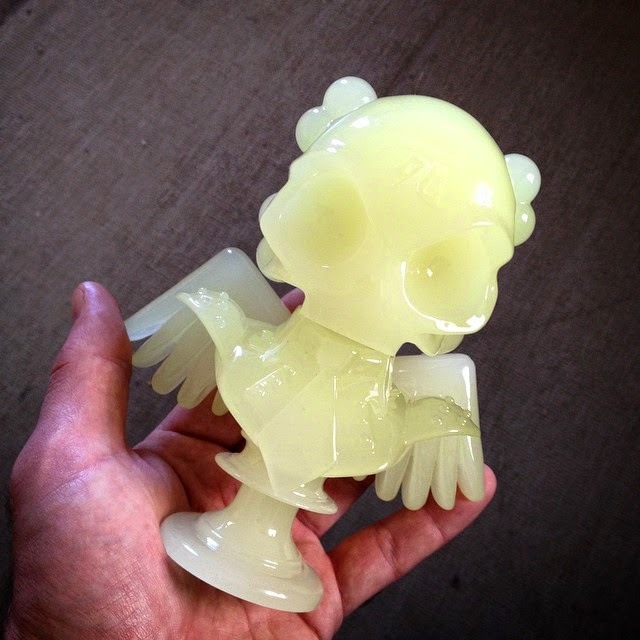 It's not difficult to identify the form of the hand-blown glass sculpture is derivative, and even a reproduction of, the Kidrobot Munny and Bot platform- two of Kidrobot's most internationally recognized product lines. What's not immediately visible in the advertisement would be the artist(s) responsible for a piece Puffpipes.ca boast as a representation of their industry's creative leaders. I take issue with Puffpipes.ca 's portrayal of an unspecified reproduction of a designer toy form, as a reflection on their industry, without appropriate context. It gives the impression that Puffpipes.ca would have readers believe these designs are singular to their product lineups, and wholly original to the "industry leading artists" whose work they represent and sell. The originating artists Coyle & Slinger are fully transparent about the origins of their works, and their relationships to Kidrobot. When this information is withheld from distributor's advertisements, website, social media & informational outlets, it muddies responsible advertising practice. Artists distributing through retailers like Puffpipes.ca may be wary of the efficacy of the promotion they may receive, or the communication of their practice. You can find more of Coyle Condenser's hand-made glass sculpture work here, and through Photographer @glassotaku on Instagram. Cole Brenner [ColeBrenner.com] is bringing his graphic design style to the toy world with the release of “My Bomb to Bear.” Five blue My Bomb to Bear figures were created for a Tenacious Toys Super Series Sundays release on September 21. The custom boxed toys have a bear strapped to a rocket that's mid-flight; each 3.5in resin figure is individually hand cast & painted. Cole's experience as an apparel designer for J!NX & TAPOUT has been translated into his personal artwork which packs a dark & humorous punch. The five My Bomb to Bear figures allocated to Tenacious Toys (above) contain one tentacled chase and four regular blue colorway figures. 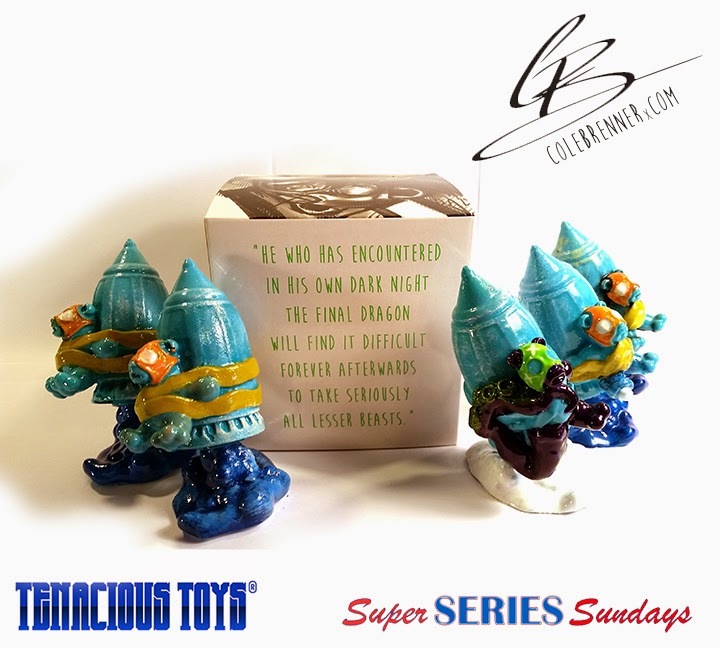 This Super Series Sundays release will take place at 6PM on Sunday September 21, 2014. Each blind-boxed piece will be $65. 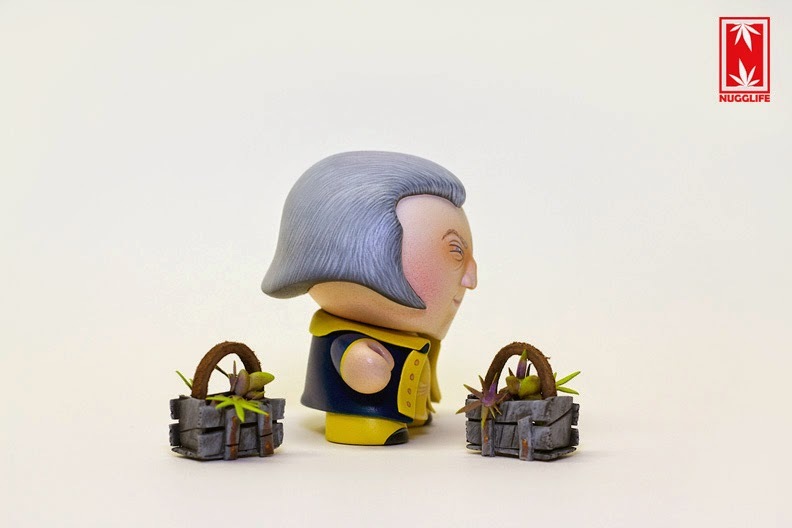 The entire My Bomb to Bear series is made up of 60 blind-boxed pieces. 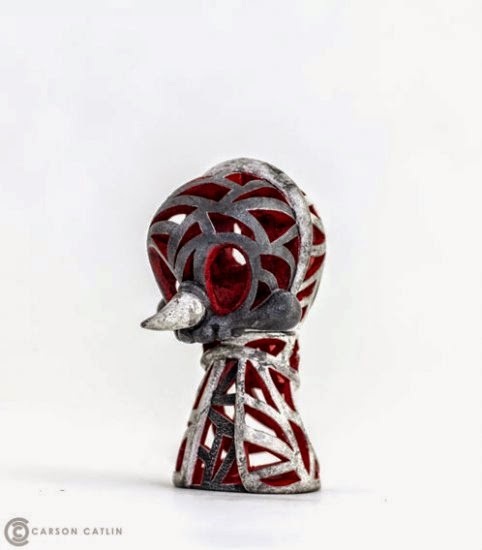 Some Chase versions have missing limbs with metal caps, Tentacles and more fun madness. 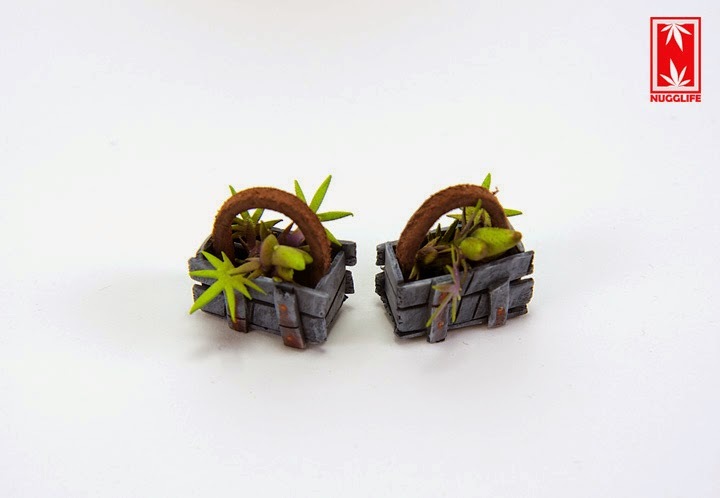 Gro-Pods are Nugg's genius creation for personal growing. Pretty affordable and very durable these environmental climate control pods will grow the stinkiest, dankiest, Nugs known in Nugglife.. come's pre-set, just gotta shine some light through. 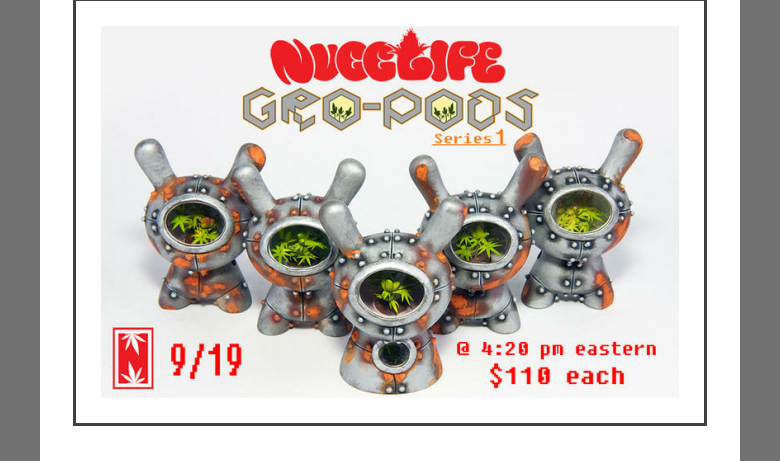 Gro-Pods series 1 is ready for release this Friday, September 19, 2014 at 4:20pm eastern for $110 each. available at his online shop... there are only 5 so good luck!!! 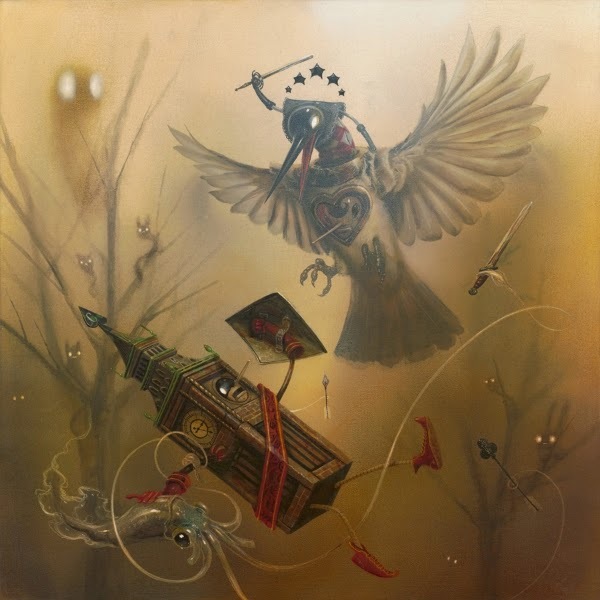 Craola, Greg Simkins, is an amazing artist with a super creative imagination. One of his latest prints to become available is called "Killing Time", which leans towards the Brown/Orange color spectrum while having pops of reds to break up the monotony. Limited to just 75 pieces, with an additional 5 sold out Artist Proofs, "Killing Time" is priced at $150 plus shipping. Each Giclee print is hand signed and numbered, printed on Elegance 320g Cotton Rag. Measuring in at 20" x 20", this piece will look great on any wall, with a decent frame and matting. Definitely a great piece to add to any collection, head on over to the IMSCARED website to make a purchase. 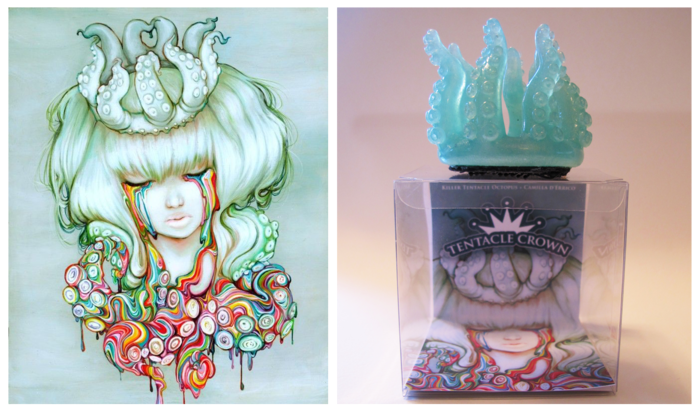 Going from 2D to 3D is the Tentacle Crown from Camilla d'Errico's "Dream Melt" painting(print). Kaity O'Shea, from Killer Tentacle Octopus, has been working with Camilla d'Errico for a year to produce the wearable version of the Tentacle Crown. Currently, the Kickstarter is fully funded and any additional funding is always welcomed. While the original prototype was created by Kaity, Mana Studios will be handling the reproduction of the piece. Check out the Kickstarter video and page for more info. There are a lot of different rewards starting at just $1. The Tentacle Crown Kickstarter is set to end on Satuday September 27th, so be sure to check it out and if possible, make a pledge for a cool reward. Welp, it's official- this here is my very favoritest Squadt ever made. The release is set for Monday, SEPT 22 - 12:00 noon central time here in the Squadt store. $105 Includes worldwide shipping. And damned well worth it if you're lucky enough to get one. 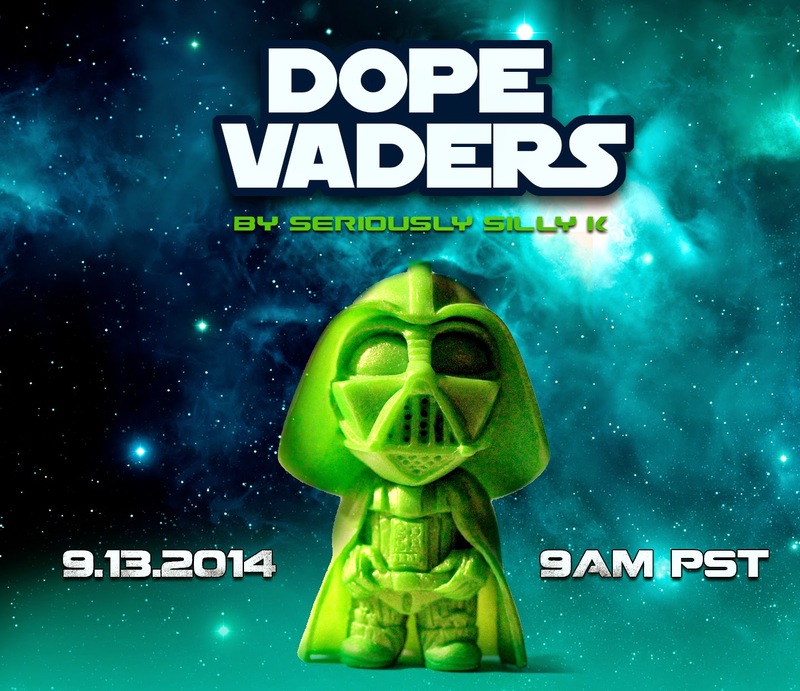 Available now is a small run of green Dope Vaders, created by Seriously Silly K as a Dopevinyl exclusive. 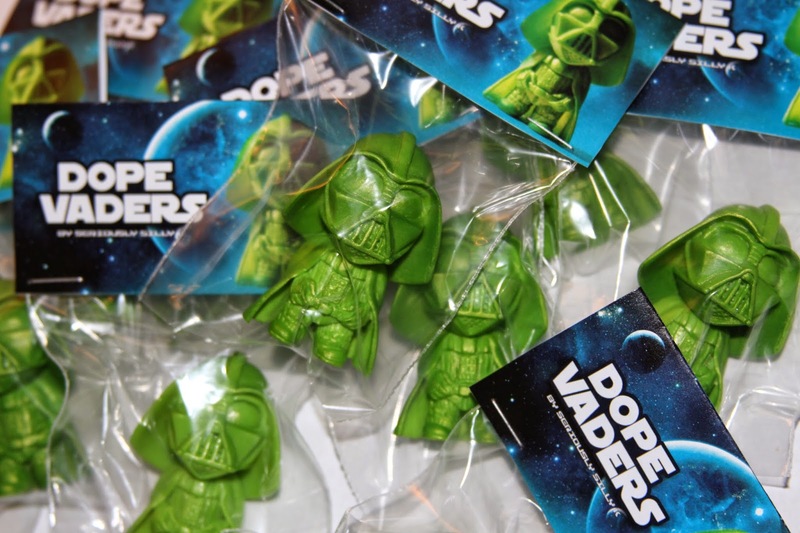 Priced at $30 plus shipping, these Dope Vaders are limited to just 10 pieces. Each piece comes bagged with a header card and measures around 2" tall. This is likely the last batch of Vaders to be made by Seriously Silly K, so once these sell out, they are gone(or at least until someone can convince Silly K to produce more). Head on over to Dopevinyl's webstore to make a purchase and also check out the other items available. 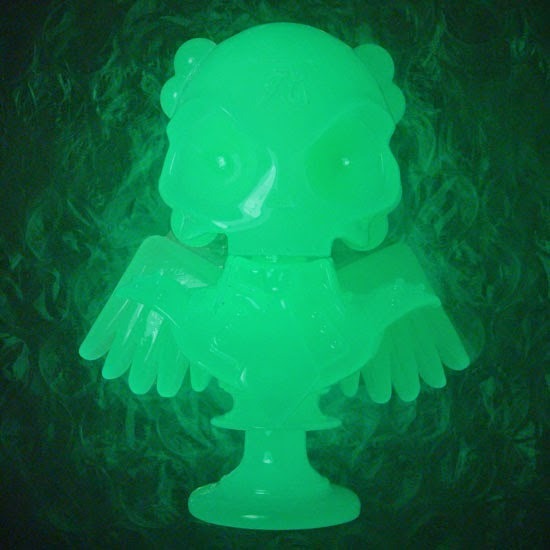 On September 18th at 10am Pacific Time, the Shiny Glow in the Dark Skullhead bust by Huck Gee will become available. Limited to just 50 pieces and priced at $125 plus shipping, people should start complaining now about how he/she was not able to procure one due to problems checking out. 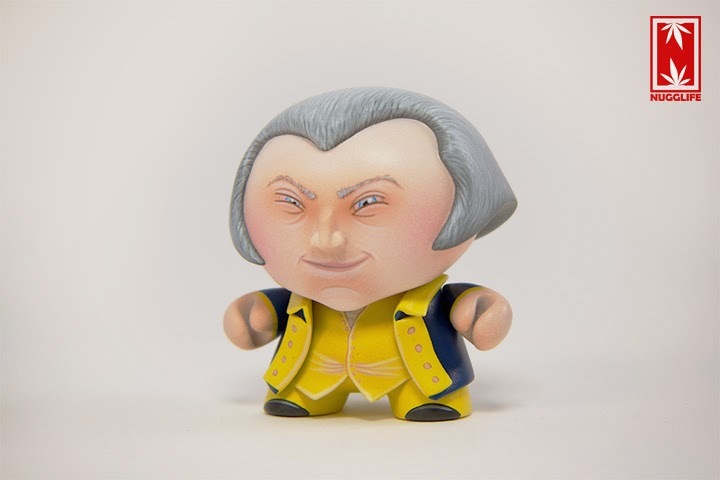 As with all of Huck Gee's releases, one should expect these to sell out rather quickly. Here's a protip: Auto-fill does wonders during checkout. Second tip: get your info ready to go by attempting to checkout by purchasing another item before 10am (don't complete the transaction, just get info inputted for Auto-Fill). GOOD LUCK! Clutter Gallery's Color Theory group exhibition features some amazing colorful work by some creative artists. 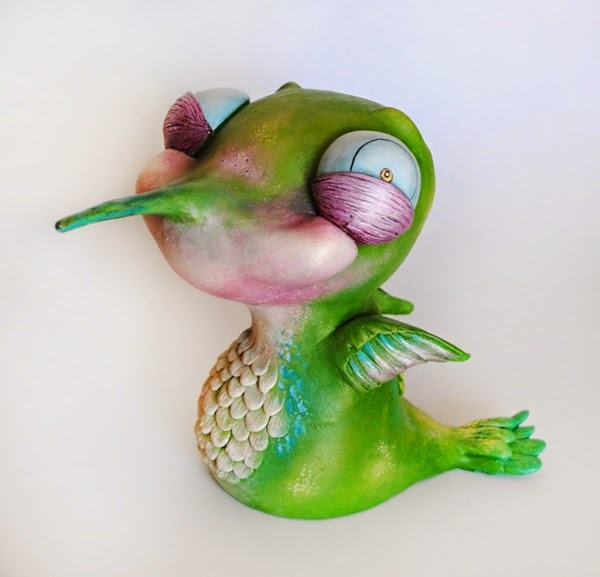 UK artist Haus Of Boz creates some wonderfully whimsical pieces of art, with her pieces selling out quite regularly. 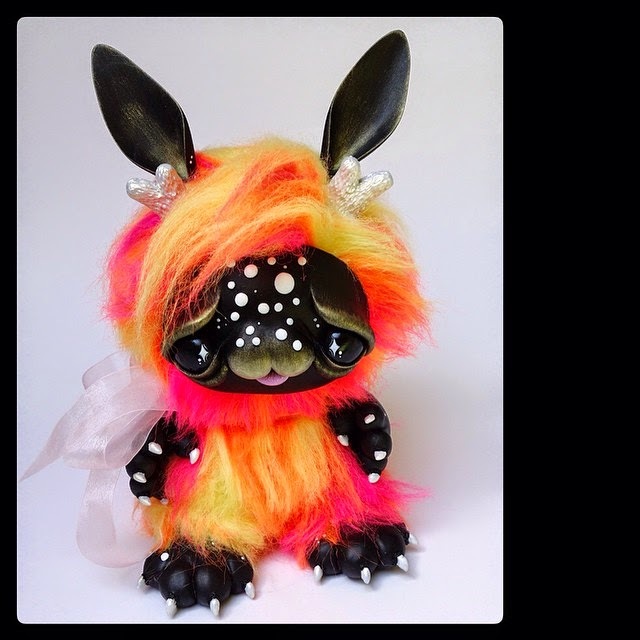 For the Color Theory Group show, Haus Of Boz created Puffy the Jackalope, a custom 8" Dunny, which barely resembles a Dunny. 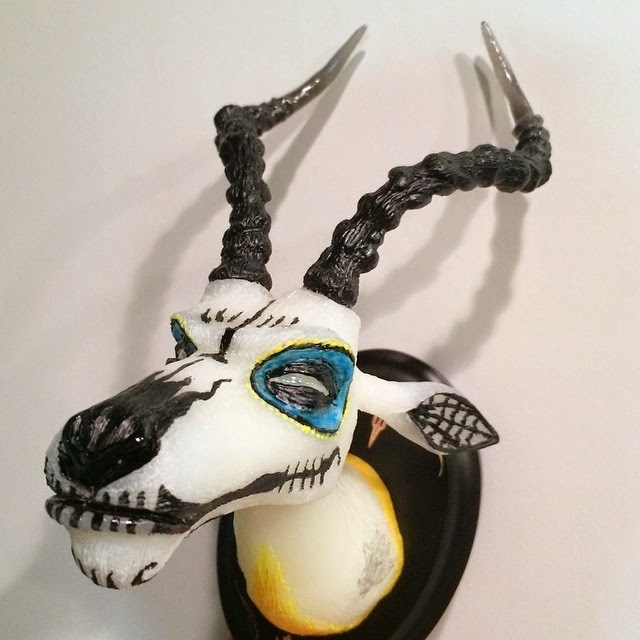 With colorful fabric, amazing sculpting, and some clean paint work, Puffy the Jackalope ends up standing at around 10". This piece, as well as many others, is currently available through the Clutter Gallery webstore. 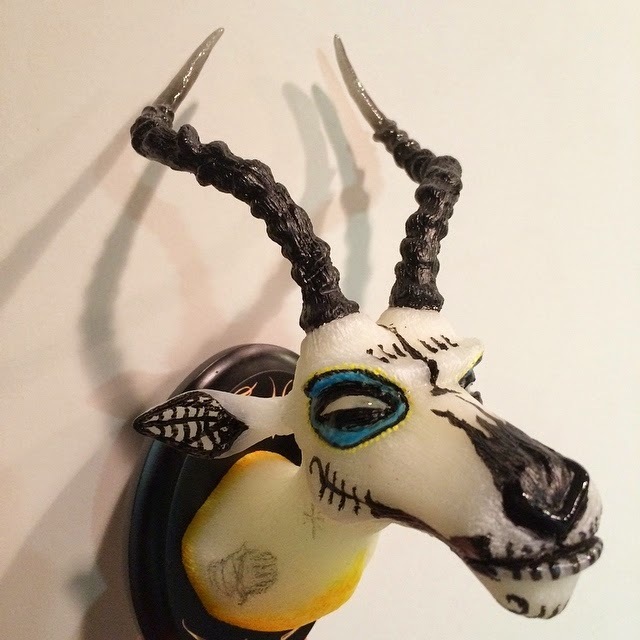 Puffy the Jackalope is available now and selling for $325 plus shipping. Artist Fuller, of Fuller Designs, is taking his created customs to eBay. This is actually a wonderful idea, considering his custom could go for a few bucks or $100, only time will tell. This weeks Lil' Jammie of the week is TMNT: Donatello. Complete with a purple outfit and bo staff, this Lil' Jammie sits at 2.75" and will make a perfect desktop collectible. Fuller is going to be putting up a new Lil' Jammie TMNT every week, so there is a chance to be able to collect all 4 Turtles. With the bidding of each auction starting at $0.99, everyone should check out the auction and place a bid. Also, DIY versions of Lil' Jammies can be purchased through Fuller's webstore. Four Horsemen Toys launched a very successful Kickstarter last year to launch the fan selected Gothropolis Raven Action figure. Not only did the Kickstarter surpass the original funding goal, it also surpassed all of the stretch goals. As production moves closer and closer to shipping, the Four Horsemen have made all of the 13 figures available for Pre-order on Store Horsemen. 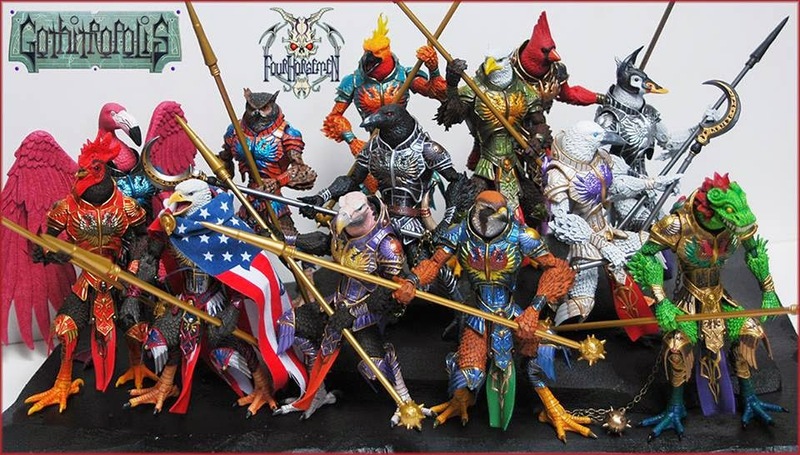 Almost all of the Kickstarter figures are available, except "Minotaur The Duck" is a Kickstarter Exclusive and therefor not available. 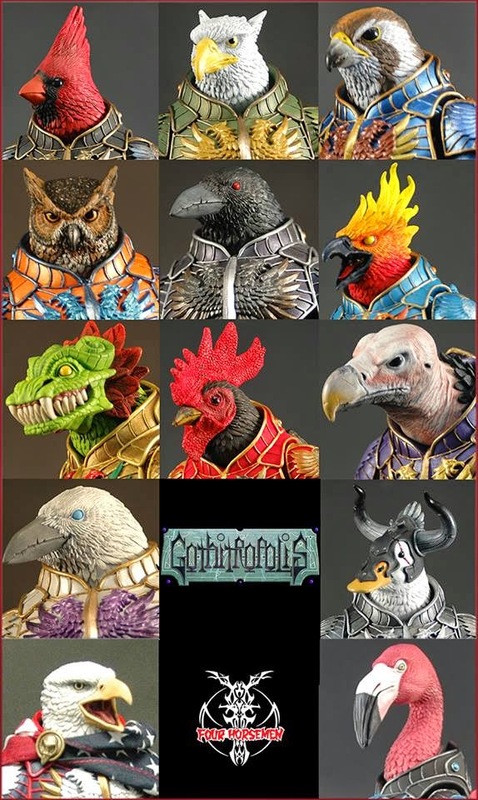 As of this post, Eagalus (Gothropolis Packaging) is the only single figure sold-out, however, this figure can still be purchased in the 13 figure super set. Each individual figure retails for $32 plus shipping, while the complete super set retails for $375 plus shipping. Check out all these amazing figures and accessories on Store Horsemen and pre-order your favorite ones, it'll be the right move. 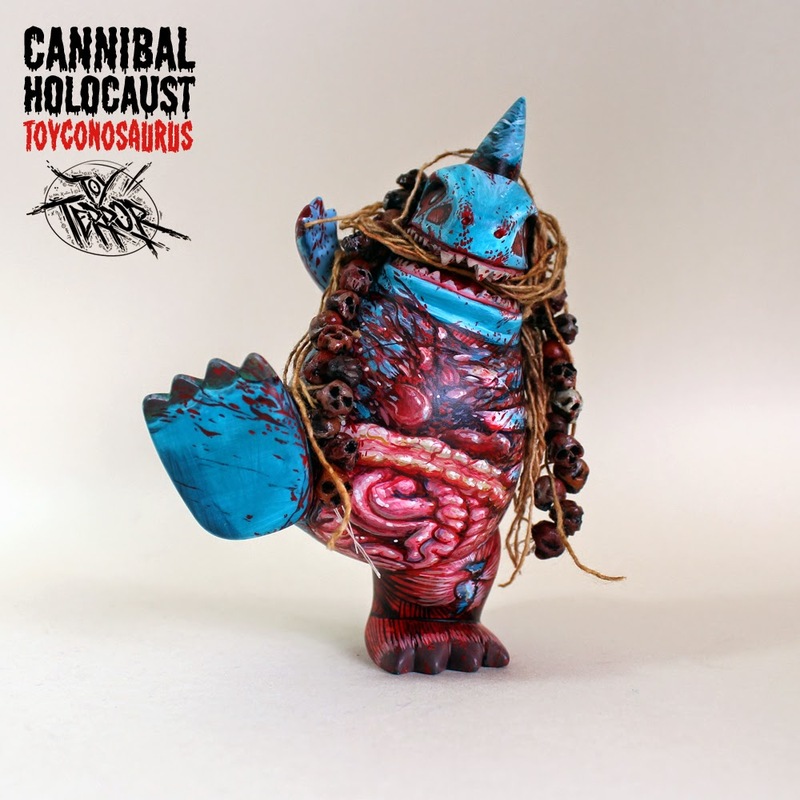 This latest piece from Toy Terror features a custom Toyconosaurus figure based on a 1980 Italian film, "Cannibal Holocaust". 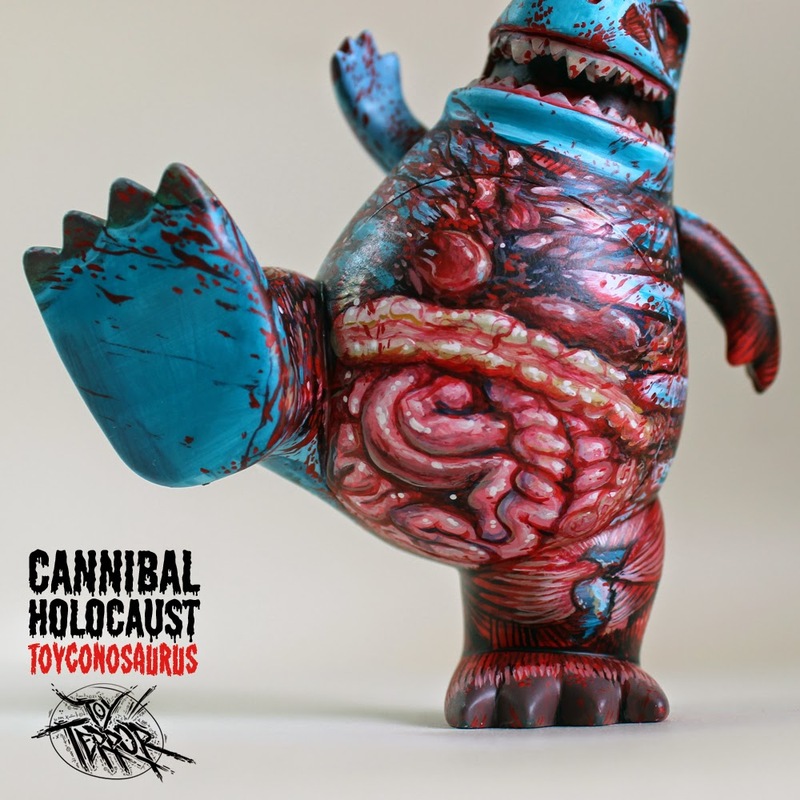 The Toyconosaurus figure was chosen as the base by the person who commissioned the piece and Toy Terror did a wonderful job turning it into a nice representation of the film it's based on. The film tells the story of a missing documentary film crew who had gone to the Amazon to film cannibal tribes. 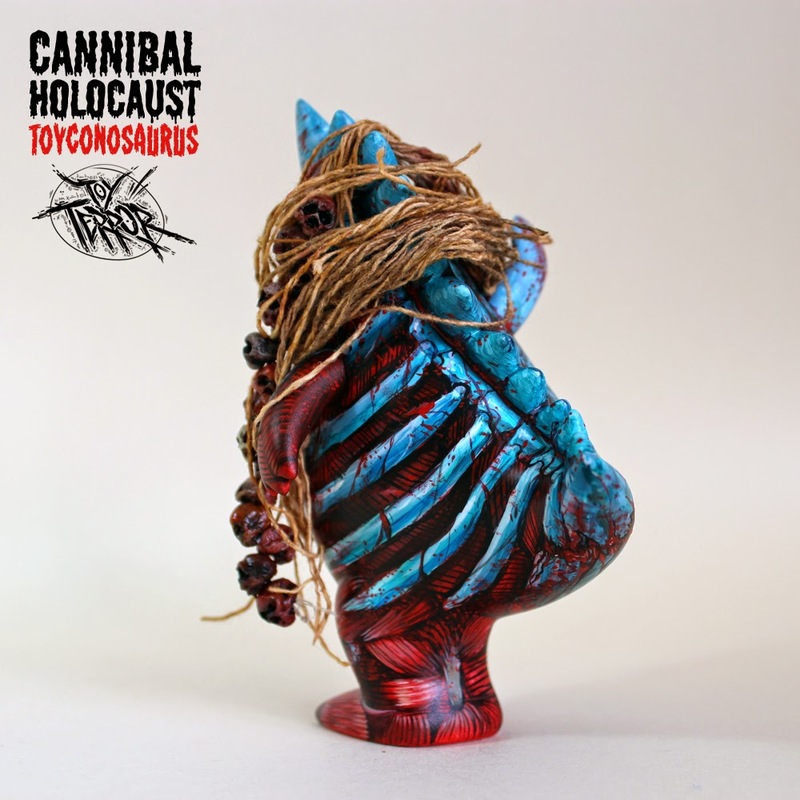 Cannibal Holocaust achieved notoriety as its graphic violence sparked a great deal of controversy. I wanted to capture the essence and key elements of the film using one of my favourite platforms, the T-Con, as chosen by the client. First and foremost for the skin and skeleton, I wanted to capture the smokey, ash blue that the tribesmen are smothered in and take it up a notch. This is complimented with a tribal headdress created from unwoven thread, that's been dyed with a mixture of paint, ink and tea. Around the neck of the T-con is a trophy necklace comprising of two-dozen individually sculpted and hand-painted human skulls. For a movie like this, how can I ignore the gore and guts?! And as instructed, I went to town on tearing open the T-Con to expose the gruesome insides, flesh and bone! A true gorefest! This wonderfully painted piece was a commission and not for sale, but Toy Terror's commission list is still open for September and October. For those who want a commission, be sure to contact Toy Terror through any of his social media outlets. On September 13th, 2014, Clutter Gallery opened a group exhibition called "Color Theory",featuring colorful artist works from all around the world. Artist One-Eyed Girl, Kasey Tararuj, offered up 5 unique and colorful pieces for the show. 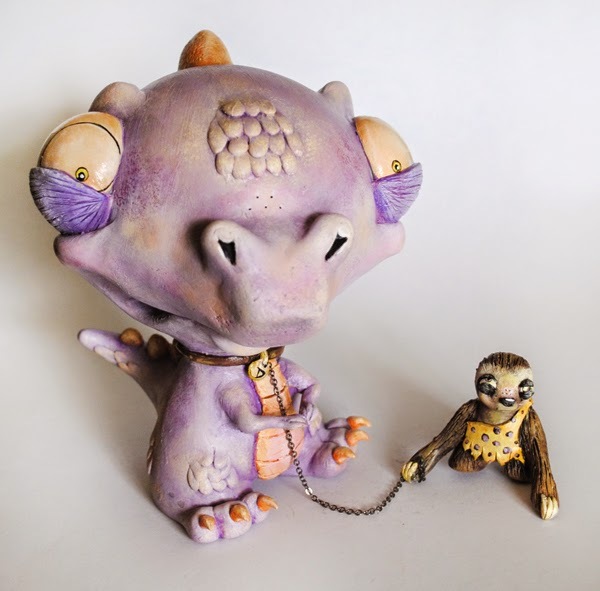 First up is a custom Raaar and micro munnyworld pair of figures called Dorkosaurus "Dorko" Rex and Neandersloth. "Dorko" is the pet of Neandersloth. This pair of customs are available through the Clutter Gallery webstore for $300 plus shipping. 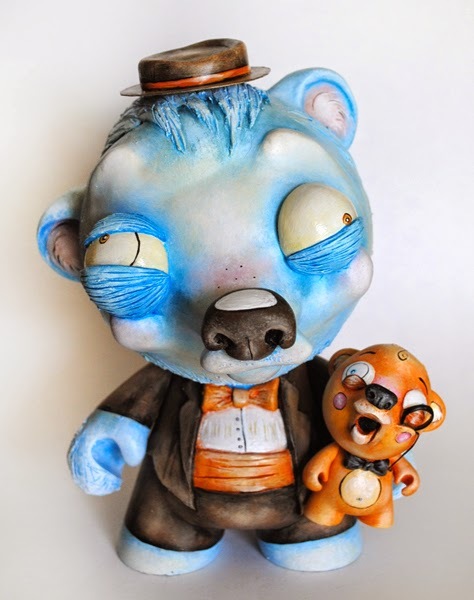 Bizmo and Buddy is another pair of customs, created from a 7" Munny and Micro Munny. Featuring One-Eyed Girls unique style and sculpting, this pair of figures work well together, with the colors of Buddy tying in nicely with Bizmo. This pair is available for $300 plus shipping through the Clutter Gallery Store. Camo Cameron is a silly One-Eyed Girl chameleon character made using a 4" Foomi. Chameleons are awesome and Camo Cameron is not only a silly chameleon but is also a nice representation of One-Eyed Girl's style. This piece is available for $175 plus shipping through the Clutter Gallery online store. 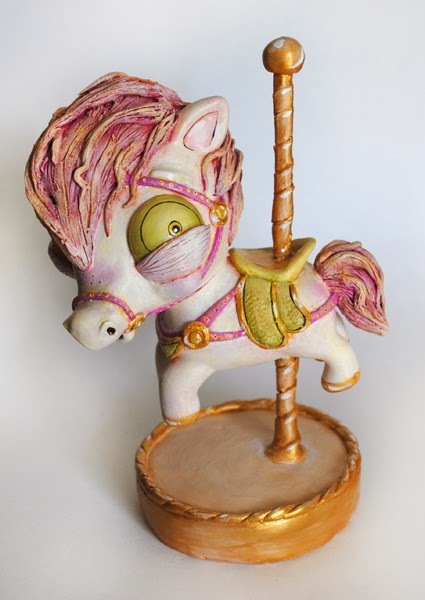 The last two pieces from One-Eyed Girl is a chubby hummingbird named Neddy Needlenose and a carousel horse named Porcey the Horsie. 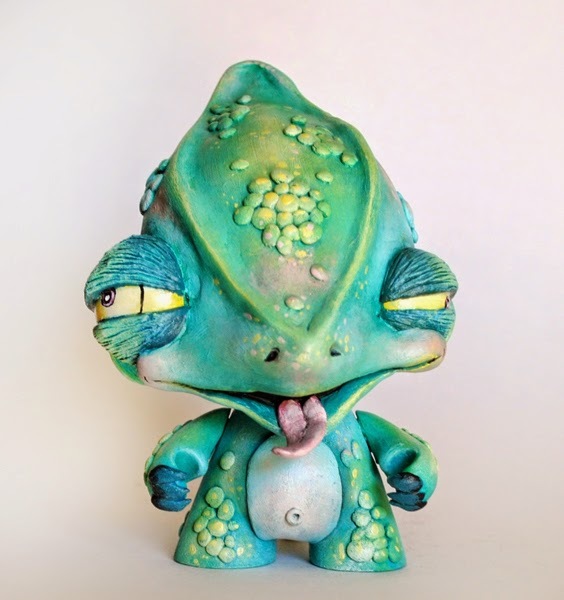 Neddy Needlenose is a custom 4" Rooz figure, available for $175 plus shipping through Clutter Gallery. Porcey the Horsie is a custom Tokidoki Unicorno figure, available for $200 plus shipping. All of One-Eyed Girls pieces are a great representation of creating a character/figure in her own unique style. Camo Cameron is not only a Chameleon, but a One-Eyed Girl chameleon. It's nice to see One-Eyed Girl's unique take on each of these figures, especially since all of them feature a ton of sculpting work and paint application. Be sure to check out the Color Theory group show online through Clutter Gallery, or stop by the actual gallery if in the area. 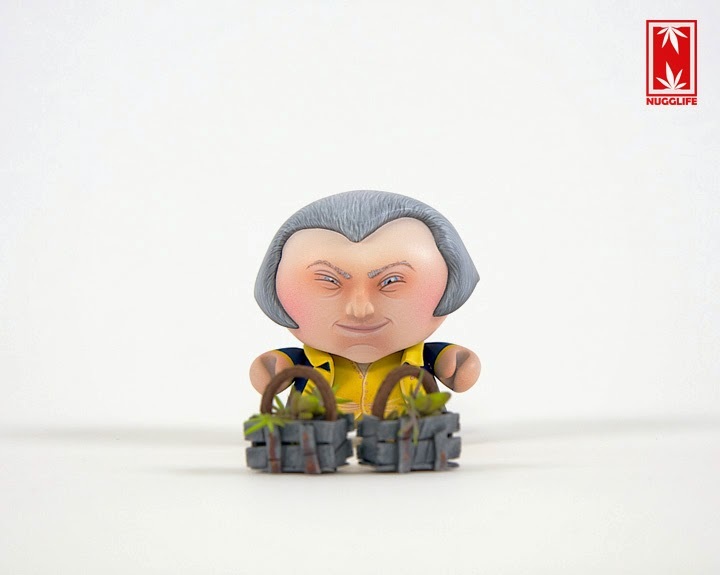 The JC Rivera Dead as F#ck figure is hitting the streets! Launching by way of a custom show at New York Comic-Con, this brand-new resin figure was designed by JC and cast in resin by We Are Not Toys. The Dead as F#ck custom show will kick off at the Suburban Vinyl booth 208 on October 9th. Two different limited-edition exclusive colorways will be available at Booth 208, in addition to the customs in the show. Follow tag #deadasfck on IG to keep up with news and artist submissions to this show. 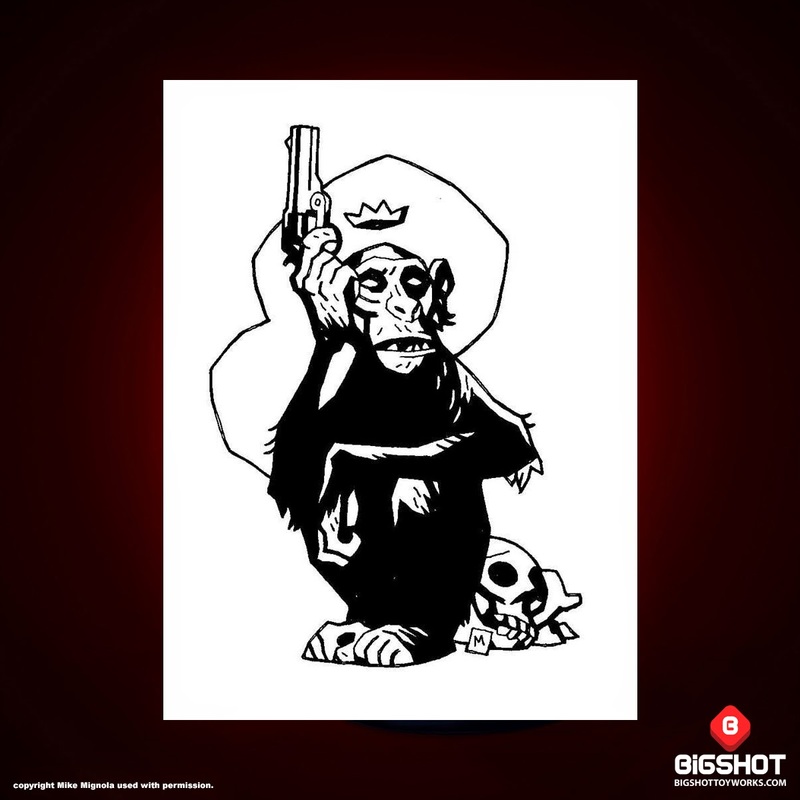 Or maybe it’s just a monkey holding a gun, drawn by the unmistakable hand of Mike Mignola of Hellboy fame! 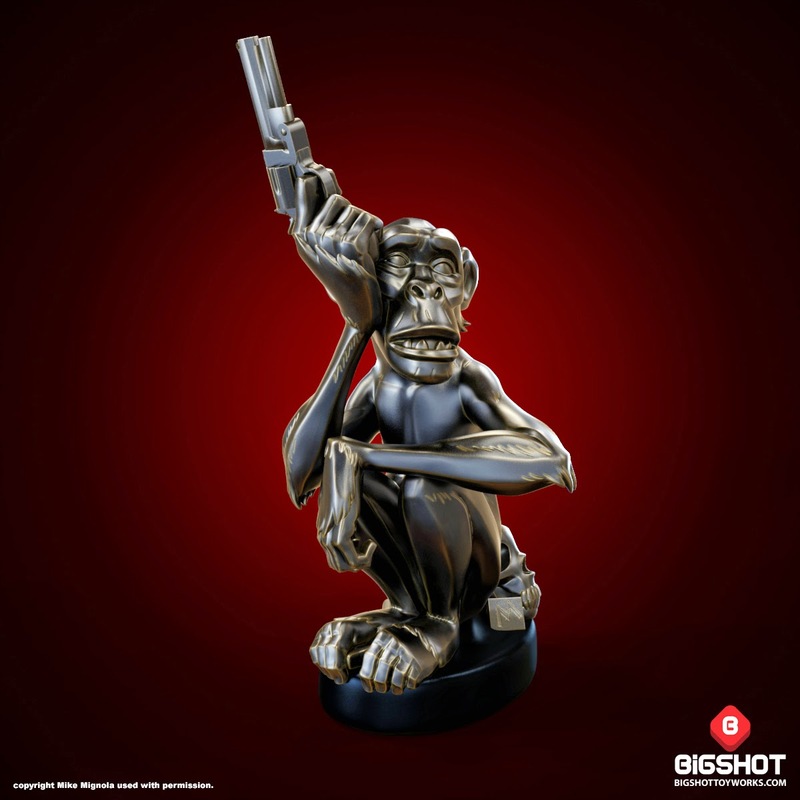 With a love that knows no bounds for Mike’s body of amazing work, Bigshot Toyworks is proud to present “Monkey With A Gun,” a limited-edition, hand-crafted polystone statue standing 9.5 inches tall with a faux-bronze paint application. 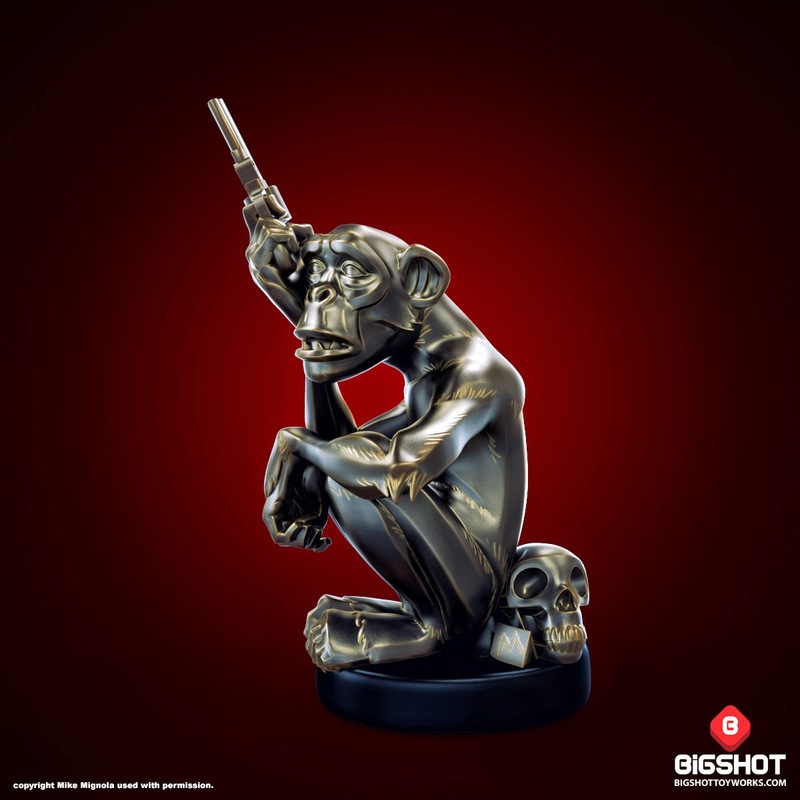 Based on Mike Mignola’s striking image of the same name, the Monkey with a Gun figure was crafted with great care by the wizards at Bigshot Toyworks. The result is a must-have piece that will be the center of any die-hard Mignola fan’s art collection, not to mention a striking point of conversation amid a comic book lover’s displays. Of course, you don’t need to be either of those things to appreciate this killer translation from page to three dimensions, with all the requisite monkey angst included at no extra cost. 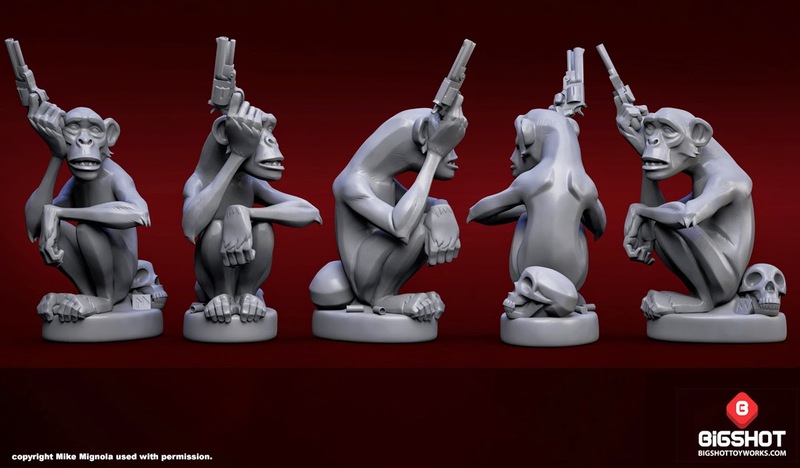 Monkey with a Gun will be limited to 666 pieces and will come packaged in a deluxe gift box packaging. This unique work of art will not be produced again in this format. Preorder customers will receive a signed and numbered letterpress print available only during the presale window. 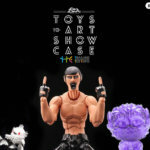 Now that Singapore's annual Singapore Game, Toys, and Comic Convention(SGTCC) is over, little known US artist Scott Tolleson has brought back some leftover exclusives. Available now in Scott's online shop is a Lime Green translucent Deadbeet, which has GID swirls. 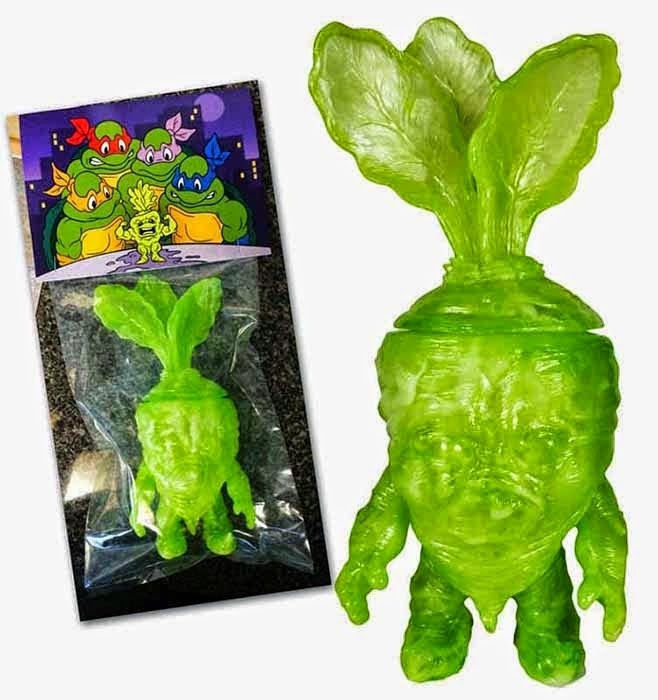 Scott's Deadbeet character is made of Sofubi and has been made in a small handful of colors. Also available is Scott's Trayjus figure, which comes in a polished purple resin, exclusively made for SGTCC. Purple Trayjus is limited to just 30 pieces, as is the Lime Green Deadbeet. Each of these pieces are selling for $60 plus shipping and available through Scott's online shop. Go forth and support this little known artist as he tries to build a name for himself. Cardboard Spaceship Toys SDCC Leftovers Available Now! For all those who missed out on SDCC this year, Cardboard Spaceship Toys has all of their SDCC leftovers available online. With many great pieces still available, now would be a good time to add that Carson Catlin Wandering Misfits piece, or even an Ink Slinger Wandering Misfit customized by Brandt Peters. Be sure to check out Cardboard Spaceships Exclusives pages to see all the available pieces.